Our Hot & Spicy Bloody Mary Mix delivers a premium cocktail from the finest ingredients that is thick, savory, and full of fresh flavor, & perfect heat. 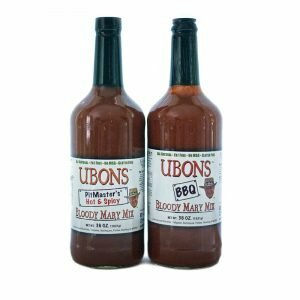 Ubons PitMaster’s Hot & Spicy Bloody Mary mix incorporates traditional bloody mary flavors but is also chock full of bits of garlic & onion flake, celery seed, white pepper, chipotle powder for smokiness, cayenne and flavors of our 5th generation, World Championship UBONS Sauce, which is a Memphis style, and, of course, the flavors of fresh dill pickles. Don’t forget to shake the heck out of this premium mix! Whether you’re using top-shelf vodka or your old standby, Ubons always delivers a premium cocktail made from the finest ingredients. 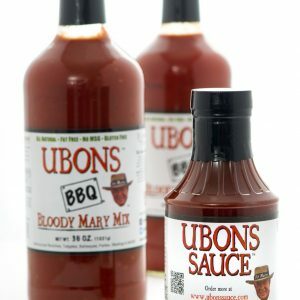 UBONS Hot & Spicy Bloody Mary Mix is packaged in a true 1 Liter glass bottle and is NT WT 36 OZ. Packaged in a true 1 Liter glass bottle and is NT WT 36 OZ. Simply the best Bloody Mary Mix bar none! 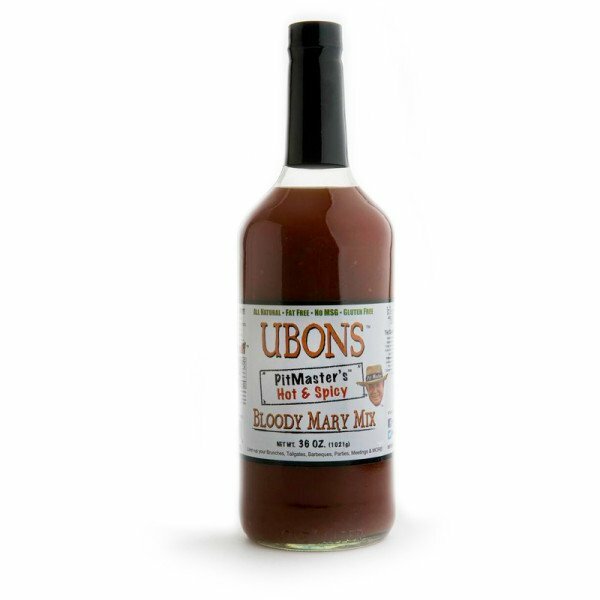 We were fortunate to have a local Jazz/Rum bar owner turn us onto Ubons Hot & Spicy Bloody Mary Mix. Since then, we are frequent Sunday Brunchers at the place for the Bloody Mary’s. We have introduced many people to Ubon’s and everyone has loved it. We ran through 12 bottles in Key West in a week! Out of 20 people one person likes the traditional Ubons Bloody Mary Mix better. The rest are Hot & Spicy. The Mix literally stands on its own. I usually add the bacon, cheese, and an olive or 2; but there is no need to mess with the mix. Try some today and you will be hooked! The Mix really makes me want to head north to try the BBQ! My favorite Bloody Mary mix! Wish it was sold in Chicago. Great consistency and texture. Flavors are fantastic. I love to add the mix to different food recipes….simply delicious!!! Thanks Ubons!!!! We were lucky enough to be introduced to Ubon’s Hot & Spicy Bloody Mary Mix at a beach bar in Fort Myers, Florida. It’s the absolute best mix I’ve ever tried, our whole group fell in love with it. We loved it so much that I ordered three cases as soon as we returned to Ohio! Thank you for making such a great product, we’ll definitely be customers for life! 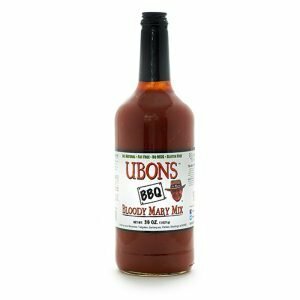 I was watching a bbq wars tour episode on youtube, where the Shed BBQ joint mentioned about Ubon’s bloody mary mix, and I immediately had to try it. Let me just say, they were right in saying this is the best Bloody Mary Mix ever. I absolutely love it! I purchased the Bloody Mary Mix first, and once I tried that and loved it, I had to make another order for their bbq sauce. The bbq sauce is also fantastic. I will definitely be buying more of both once I run out. A friend brought a bottle of “Hot and Spicy” Bloody Mary mix back to Michigan from a vacation in Florida. I am absolutely hooked. It is by far the best bottled bloody mary mix I have ever had, needs nothing added other than a strip or two of bacon and a spear of pickled asparagus. Have shared this with friends and they agree. The absolute best addition to the Sunday morning “Bloody Mary Porch Party” ever.